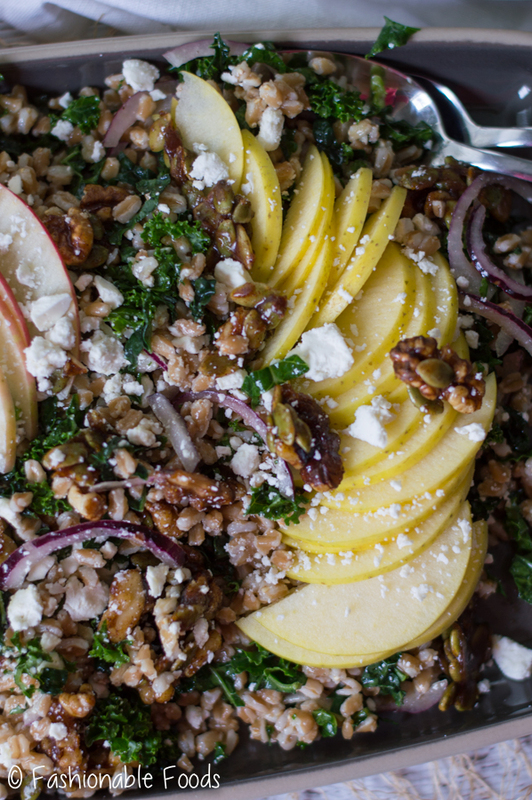 Thanksgiving Farro Salad needs to make an appearance on your holiday table. 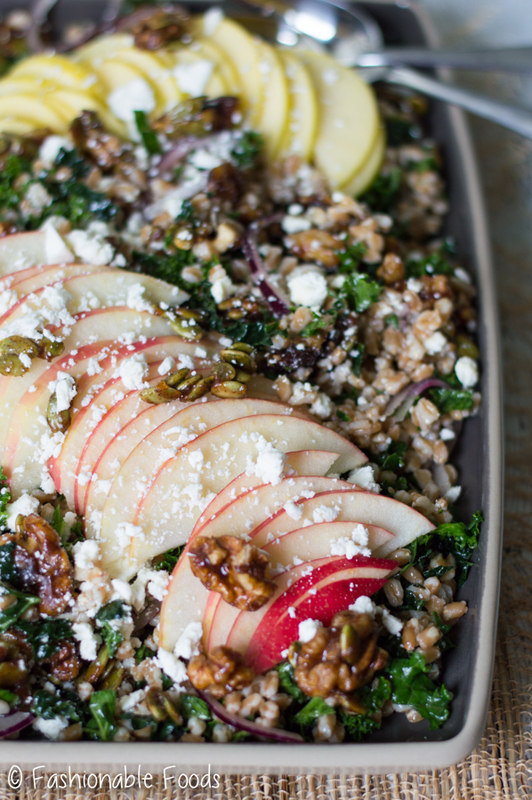 It’s full of chewy farro, crisp apples, greens, red onion, salty feta, and crunchy candied walnuts and pumpkin seeds. Tossed with a tasty apple cider vinaigrette, it’s the perfect Thanksgiving side! Happy Thanksgiving week! Hopefully you’re fully prepared for the big day by now, but if you’re more of a last minute type, that’s ok. There’s still plenty of time to get organized! I love having all of the classics on the table. Turkey (with gravy) and mashed potatoes are an absolute must for me. And if I’m being completely honest, if that’s all I had, I wouldn’t be upset about it! Of course the stuffing, cranberry sauce, and sweet potatoes are all great, too. Once I’ve got all the typical dishes covered, I like to get creative with veggie sides/salads. It can be something simple like this yummy vegetable toss, or something a little fancier (but still easy) like today’s recipe. Either way, it’s fun to add new dishes every year to keep things interesting and have your guests looking forward to what’s new. 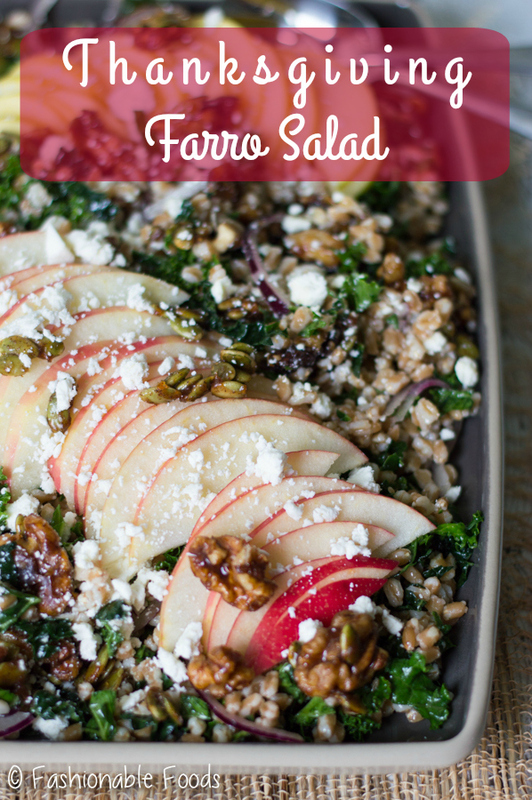 Although, I have to warn you, I think this farro salad is going to become a Thanksgiving staple! I’m a huge fan of grain salads. 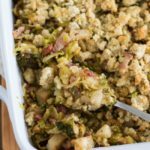 There are so many options for flavors and textures and they can be made ahead of time, which is a life-saver during the holidays! For this salad I decided to use my latest obsession: farro. If you’re not familiar with farro, it’s a form of wheat that is typically harvest from ancient forms of wheat like einkorn and emmer. Unfortunately, this means it’s not gluten-free. 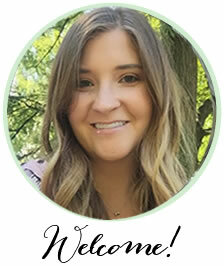 For the last 4 years I’ve eaten gluten-free because of IBS, but thankfully pregnancy has made it possible for me to comfortable enjoy it again! Therefore, I’ve been experimenting with foods that I wasn’t able to eat before. Farro, like a lot of whole grains, is super nutritious. It contains fiber, protein, and plenty of important vitamins and minerals. In fact, it actually contains more fiber than a lot of other popular grains! 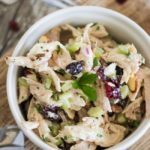 It has a mild nutty flavor and is chewy in texture making it perfect for all kinds of dishes, especially this yummy salad! This simple salad is full of my favorite fall flavors. 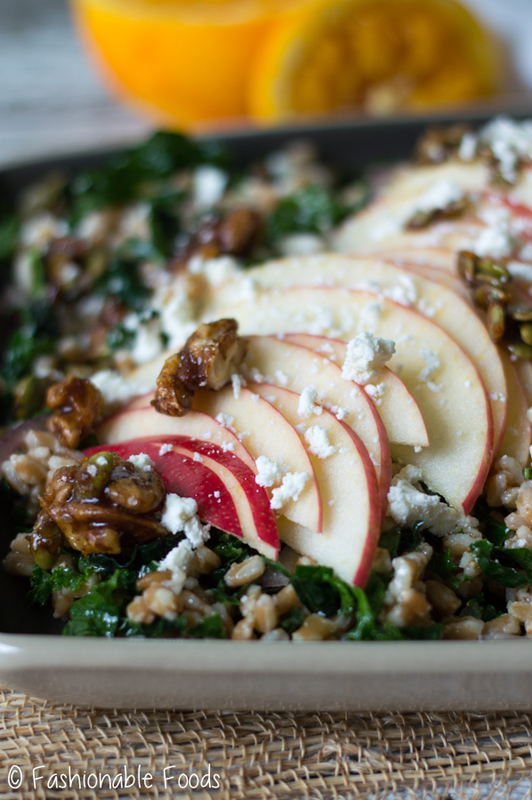 Crisp in-season apples, fresh kale, candied walnuts/pumpkin seeds, and apple cider vinaigrette. The only cooking you have to do is the farro and the candied walnut/pumpkin seeds, but both can be done a few days ahead! Everything else is a matter of chopping and tossing, so it’s easy peasy. And, if need this salad gluten-free don’t panic. 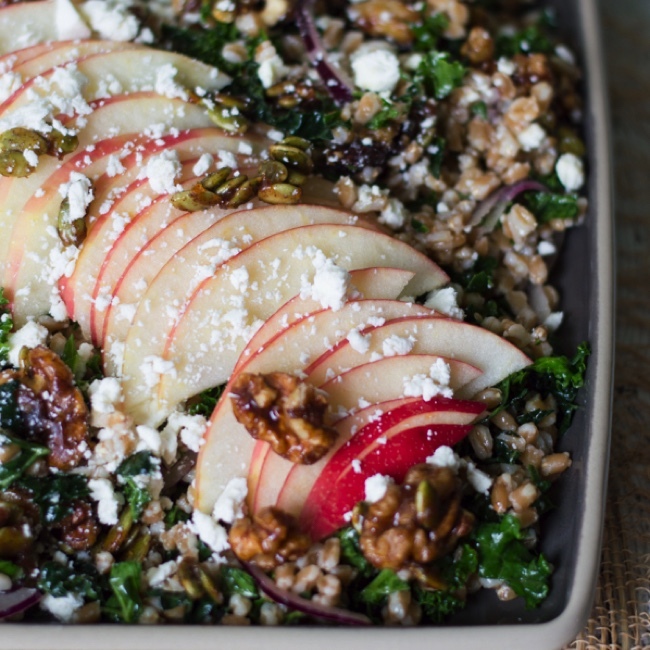 You can simply swap out the farro for a different grain like brown rice or quinoa! No matter how you choose to make it, it’s going to be a hit on your Thanksgiving table. Plus, the leftovers are amazing, too! 1 Cup Farro, rinsed, try brown rice or quinoa for a gluten-free salad! In a small pan, melt the butter with the brown sugar, cinnamon, orange zest, and orange juice. Add in the walnuts and pumpkin seeds and toss to coat. Stir in a pinch or two of salt and then pour the mixture onto a small baking sheet coated with parchment. Bake the nut mixture for 10-15 minutes, stirring halfway through. Allow the mixture to cool completely before breaking up and using or store in an airtight container. Combine the rinsed farro with the water and bring the mixture to a boil. Season with salt and reduce the heat to a simmer. Allow the farro to cook for about 25 minutes or until the liquid is absorbed and the grain is tender. Cool completely before tossing the salad. 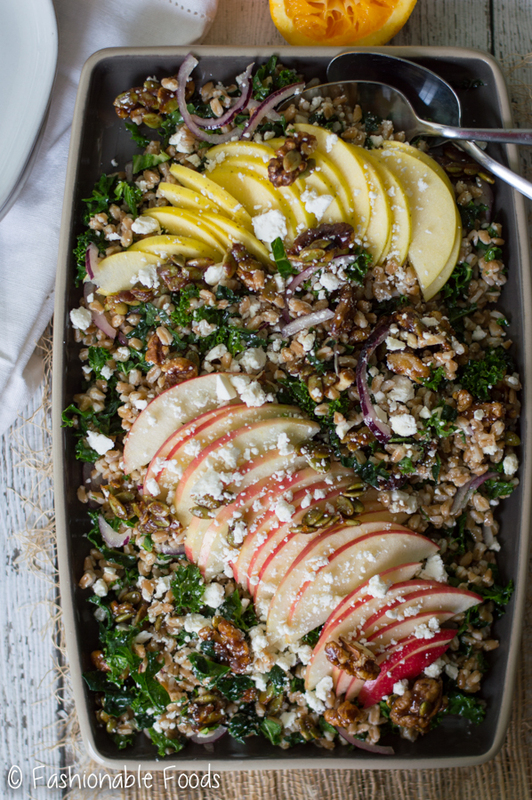 Once the farro is cooled, toss it with the kale, apple, red onion, ¼ cup of feta cheese, and half of the candied nut mixture. Combine all of the ingredients for the dressing into a small mason jar. Shake well to combine. Pour the dressing over the salad and transfer it to a serving platter or bowl. Top with more feta and the remaining candied walnuts and pumpkin seeds before serving. •Make the candied walnuts and pumpkin seeds and store in an airtight container. 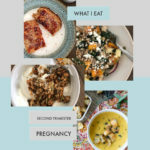 •Cook and cool the farro and store in the fridge for up to 3 days. When ready to serve, chop the apple and then toss the salad all together according to the recipe.